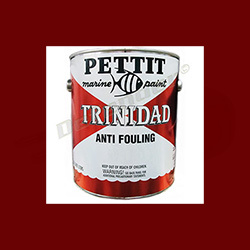 Pettit Trinidad is the top-of-the-line in conventional antifouling paints and is one of the most respected names in the industry. Trinidad is heavily loaded with cuprous oxide. As a result of this there is a tendency for settling to occur, especially if the paint has been on the shelf for several months. It is necessary to thoroughly mix the paint before using. If possible shake the can of paint on a mechanical paint shaker. Before using check the sides and bottom of the can to make sure all the pigment has been mixed in. If mixing is going to be done with a wooden paddle or an electric drill mixer, pour off half of the liquid from the top of the can into another can and then properly mix in any settled pigment; then remix the two parts together thoroughly. Adhere to all application instructions, precautions, conditions and limitations to obtain optimum performance. Refer to individual labels and tech sheets for detailed instructions when using associated products, etc. Do not thin Trinidad more than 10 percent (12 ounces per gallon) or inadequate paint film thickness will occur and premature erosion of the finish will be likely.